Work the weed edges or the drops just outside the weedline. You'll likely be in the 12-15 fow range. Lots of pike, sunnies and crappies. Potential for a few eyes as well. How is the ice out there, few weeks ago i was out 9 inches one spot another spot 4. Is it safe to drive yet? Or is it a day or night or morning bite. 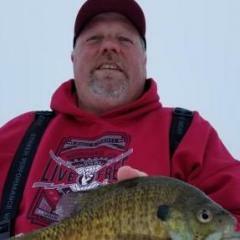 It has always been a popular ice fishing lake but never have I heard so much buzz about it. Are there Cats in Pearl? I was out there last night never seen so many ppl there before. I had what i thought was a cat on it looked like a cat seemed to big to be a bullhead, probably 3 pounds at least, but it had a yellow belly, didtn think they had yellow bellys. Any help on this one? Pearl doesn't have any catfish in it, but it has black and yellow bullheads. You likely had a yellow bullhead, but even at 3 pounds, while huge for a yellow bullhead, you still wouldn't have had a record fish. The state record yellow was caught in Lake Osakis and weighed 3-10. Thanks i was pretty confused when it popped through the hole. Anyone else having luck there? I had a bit of luck the other night. There is some fish biting there now. Size is ok with some sorting. Was out on pearl yesterday, caught 3 northerns, 2 chunky bass, and a crappie. We went way left from the access, anyone out in either of the two groups, (one straight out-one far out little to left)? It was chilly yesterday!